Here we are going to look at swing trading in FOREX from the standpoint of building a simple FOREX trading system, based on catching swing trades which is easy to understand, easy to apply and even better, can make big FOREX profits. You need to use trend lines and spot areas of support or resistance to trade into. Look for 3 tests or more – the more tests there are of course, the more valid and important the level will be. Now you have spotted the opportunity, you need to time your trading signal and correct timing is crucial to success. Many traders simply like to go short into resistance or long into support, as it's tested but this will never work. If you do this, you are guessing or hoping the level will hold and the market will not reward you for this. You don't have the odds on your side and you will end up a loser. With swing trading in FOREX (or any other method of trading for that matter) you need to trade the odds and get them in your favor and this means getting confirmation. You need to trade with confirmation of price momentum on your side BEFORE you execute your trading signal. You therefore need to wait for a test of support or resistance. Watch for the currency to turn away from support or resistance with accelerating price momentum and THEN execute trade. You are trading with price momentum and the odds are in your favor. Sure you won't catch the turn exactly and you miss a bit of profit - but if you trade this way and grab 60 – 70% of the potential overall profit, you will make a lot of money and this is the aim of any FOREX trading system. The stochastic and the Relative Strength Index (RSI) as a good pair to start with. We don't have enough time to explain them in detail here - but these are superb momentum indicators. There are many others - just pick and choose a few you like best but don't use too many – up to 3 is fine. When swing trading in FOREX, your system should be simple and robust – if you complicate it you will lose, as there will be too many elements to break. For example, if you are trading into resistance that is at a market high, you may want to use a stop reverse upon a break. Most major trends start from new market highs NOT market lows. If prices break out go with the break. The initial breakout of strong resistance, will see stops hit and new trend followers kick in and by taking the turn, you can go with this momentum. Be careful – you should only do this into strong resistance that is considered valid by the market participants. This will ensure you don't get caught trading false or weak breakout trades. When swing trading in FOREX, your profits can disappear quickly, so you need to make sure that you get them in the bank, when the risk reward is in your favor – before recoil in price sets off a counter move. Take your profits early and by this we mean. BEFORE they test the next level of support and resistance. Your aim is to “hit and run”, the closer the trade moves to a target the more chance you have of a reversal so get out early. You may miss some of the move - but as we said earlier (on getting into the trade) that doesn't matter - your aim is 60 – 70% of the overall profit potential. If you can do this regularly, you will make you a lot of money and ensure your FOREX trading strategy is successful over the long run. Only trade liquid, volatile major currencies and pick a broker that offers you tight 2 – 3 pip spreads, so they do not impact on your overall FOREX profits. A Simple Way to Make Big Profits! Swing trading in FOREX is simple to learn, easy to apply and requires far less discipline than longer term trend following. 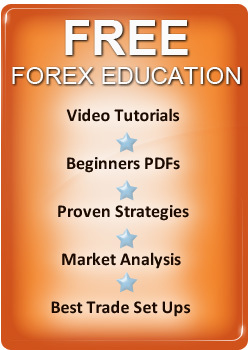 It's also exciting, fun and ideal for either novice traders or seasoned market veterans – learn and enjoy FOREX swing trading today.